Easter party ideas are great to help kick start your own creative imagination. I'm not always very good at coming up with ideas on my own. Once someone starts tossing a few around, though, I can jump on board with the best of them. Easter is special to me because of my Christian faith. You can read the history of Easter page to learn more about that if you like. Not everyone celebrates Easter in the same way, but it is always nice to be able to make your celebration a little more special with creative Easter party ideas. Here are a few tips to get you started. First let's think about decorations. If you have some nice sized potted plants, you can decorate them with Easter decorations from your local dollar store. It is obviously economical, and you can mix and match different items to get the look you want. If you want to find a cheap shop online for Easter decorations (or any holiday for that matter), I would recommend the 4FunParties.com. They've got a great variety of cute stuff, and their prices are very reasonable. A lot of people like to serve "fancy food" at a party. One way I've found to keep it simple and still "dress it up" is to make chocolate fondue. 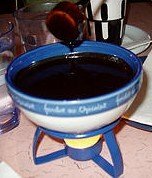 Fondue is really easy to prepare, but it is out of the ordinary and so very delicious, so it usually goes over really well. You can prepare most of the "dipping" items ahead of time so it is no trouble on the day. Here are some great chocolate fondue recipes if you decide to add this to your Easter party ideas list. If you are looking for a fun activity for your Easter party, let me recommend you try candy making! If you've never participated in group candy making, you don't know what you're missing. You'll make a mess, of course, but the laughter and fun will be worth it. You can make any of the great candy recipes on this site, but a few favorite suggestions are these. Chocolate Taffy - this chocolate taffy recipe is fun because everyone can get involved with the pulling of the taffy. You don't even have to make chocolate if you'd rather not. Taffy can be made in all different delicious flavors. Molded Chocolates - Making molded chocolates is an especially good idea for an Easter party because you can easily get the molds in shapes suited for the occasion. There are crosses, lambs, lilies, bunnies, chicks, baskets, etc. What's fun is to get a new packet of little paint brushes and some colored melts. Have a contest to see who can "design" the cutest chocolates by "painting" in the details of the molds first before filling them up with regular chocolate. This is super easy. Here is where you will find molding instructions, and all the supplies you'll need are at bargain prices at Candyland Crafts. Do you want little gifts to give to your Easter party guests? Something affordable yet clever is what I go for. One of my favorite inexpensive party favor ideas are personalized custom chocolate candy bars. There are a couple of different options when it comes to custom chocolate bars. You can order them online at places like Memory Wraps, Favor Affair, and 4FunParties.com. They are really cute and the personalized wrappers make nice keepsakes. For custom printing, it is really a pretty good price, I think. If you love the idea of personalized candy bars and think you'd like to use it on more than one occasion, you may want to just order the easy-to-use software package and make your own whenever you like. There are two companies I recommend for doing it yourself. The first is actually a subscription site called The Dapper Wrapper where you get yearly access to the service. The other company, Custom Candy Wrappers, gives you the software outright, so you can download it and it's yours for good at one low price. I'd say, check them both out before making a decision. They each have a different look and style to choose from. I hope these Easter party ideas have sparked your imagination and got your own creative juices flowing. If you've come up with a favorite Easter party idea, add it below.